VINYL SIDING - As one of the most popular siding choices on the market, vinyl house siding is long-lasting, affordable, and requires almost no maintenance. Felder Construction Inc. offers a wide range of vinyl siding options from the most trusted names in the siding industry. 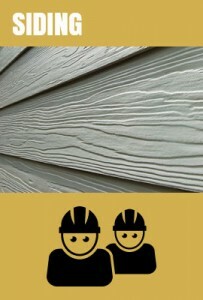 Affordable: It is less expensive than other siding products. Variety: Offers a rainbow of colour options to give your home the attractive finish you desire. Protection: Creates a weatherproof carrier for the exterior of your home which can prevent damage from wind, water and ice. Vinyl siding does not retain moisture, helping to avoid mildew and rot. Low-maintenance: Does not require ongoing painting or finishing, helping you save on expensive costs that you would incur with wood siding. If a single pane is damaged, it can easily be removed or replaced. Vinyl siding can also be washed with soap and water. FIBRE CEMENT SIDING - Fibre Cement siding is made from all-natural, non-toxic, renewable materials, creating a highly durable alternative to vinyl and wood siding products. It is composed of cement, sand, cellulose wood fibres and water. On top of the benefits you get with traditional vinyl siding, fibre cement siding offers many added benefits. Flame resistant: It is non-combustible and approved for fire-rated construction. Fade resistant: Provides 30% better fade resistance than competing products. Weather resistant: Resists rotting, warping, cracking, hail and high winds up to 250 km/hour. Appearance: It is 5x thicker than vinyl siding, providing deeper, more attractive shadow lines and a more natural wood grain texture.